Chelsea & Tommy’s spring wedding featured chic, eco-friendly decor with pastel colors and gold accents. 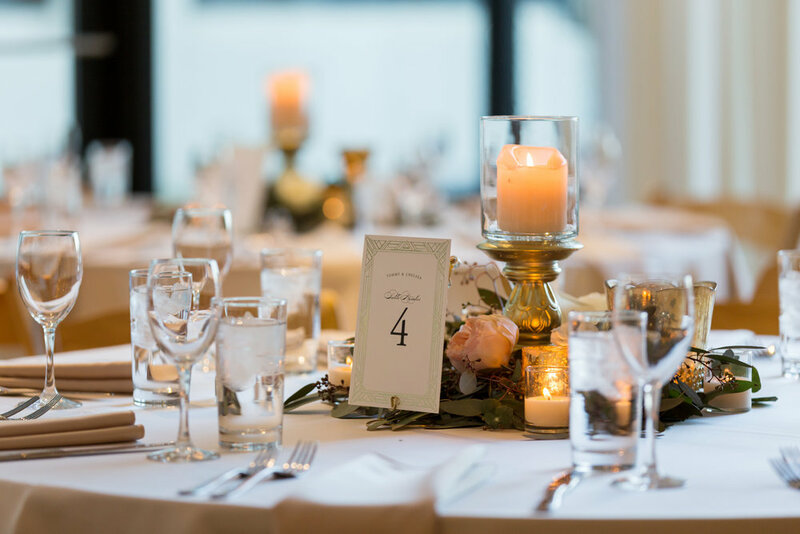 Their classic, organic style glowed in the natural light of the Greenhouse Loft ceremony area with candles lighting up their dinner reception after the sun went down. Chelsea’s bridal bouquet was a classic, round shape with seasonal blooms of peonies, garden roses, ranunculus, and spray roses. 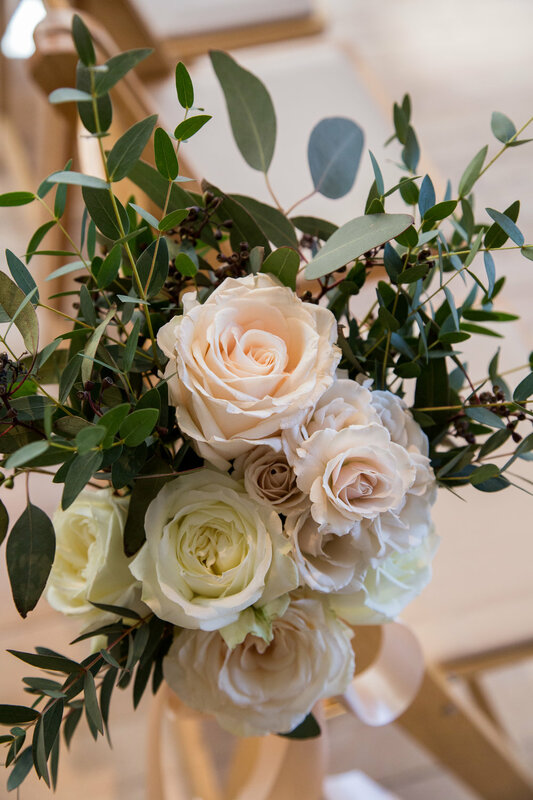 She chose ivory flowers with pops of soft peach and muted sage greenery to create a fresh, springtime look. 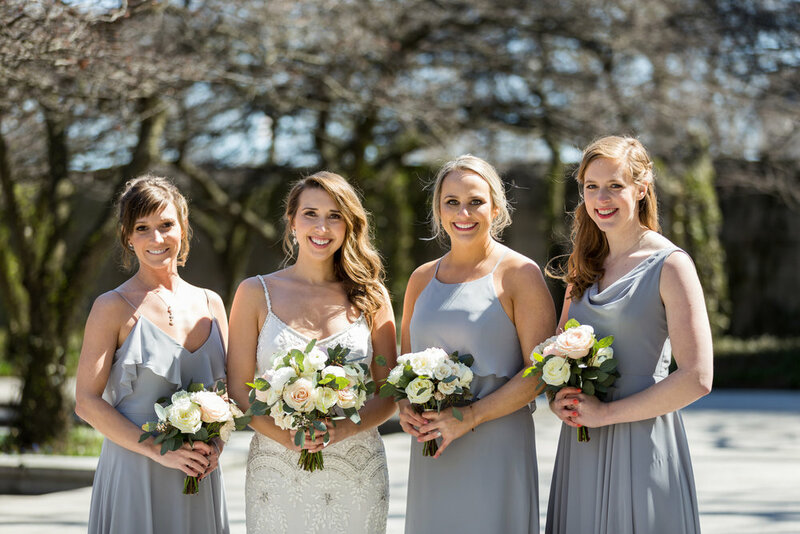 Her bridesmaids had complimentary bouquets with pastels colors and natural greenery. Tommy kept it simple with a white ranunculus and a touch of eucalyptus in his boutonniere. As guests arrived for the ceremony, they were greeted by beautiful, spring-colored flowers tied with ivory ribbon on the wooden chairs. The altar area was framed by two white pedestals that were topped with a modern gold lantern in a wreath of flowers and greenery. After the ceremony, guests moved to a romantic room filled with candlelight. The head table was lined with a garland of eucalyptus and roses and accented with gold mercury glass votives. The lanterns from the ceremony were also repurposed on to the guests tables. This wedding is a great inspiration for what a bright, cheerful, and elegant spring wedding can look like. 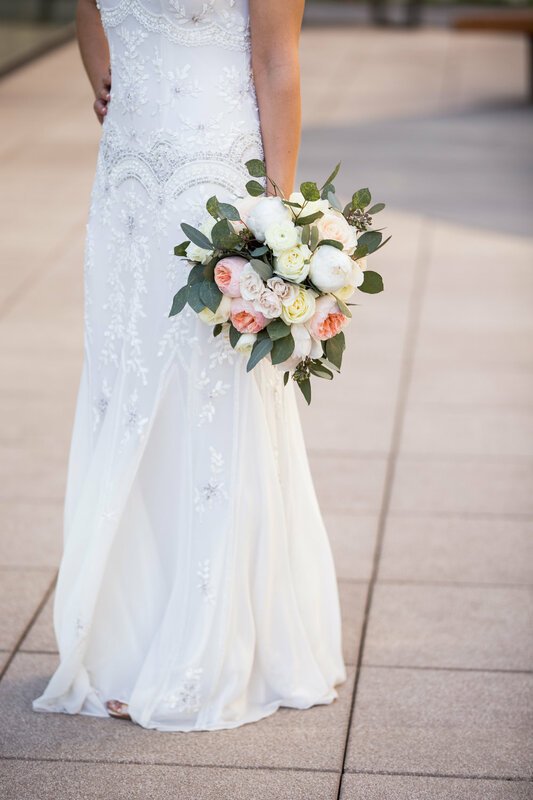 Congratulations to Chelsea and Tommy and thanks to Greenhouse Loft venue and Greenhouse Loft Photography for being such wonderful vendors to work with!